Chef Tan Yong Hua has finally find a place to call HOME. Also known of the Prince of Pumpkin, Chef Tan is the proud Co-Owner & Executive Chef of Restaurant HOME ('HOME'). A celebrity chef in Singapore Media scene, Chef Tan also proudly represented Singapore Chinese Chef Association in 2013 to conquer the Iron Chef Thailand specialised in Chinese Cuisine. HOME is located at Rail Mall Bukit Timah. The decoration is quite minimalist, and the open concept made the restaurant look big. It has a nice balance of traditional big round tables for group of 8 to 12 and square tables for group of 4 or smaller. Due to a huge following of loyal customers of Chef Tan, HOME has 2 sessions for weekend dinner and reservations are required. Our first visit to HOME was with Little Devil's BFF for dinner. Our Entrée started off from the Barbecue selection, the Crispy Roast Pork and Honey Glazed Barbecued Pork Loin (Char Siew). The roast pork has a light crispy skin, well seasoned and the meat is tender. This is one of our niece favourite dish and she will personally order two plates and for herself. The Char Siew uses a fatter cut of the loin. It is slightly burnt with honey crisp and the meat just melts in your mouth. Slightly sinful but Yummy! I personally like this version of Char Siew, but Little Devil does not. Barbecue Peking Duck with Lychee Wood came next. It is one of the Signature dish at HOME. 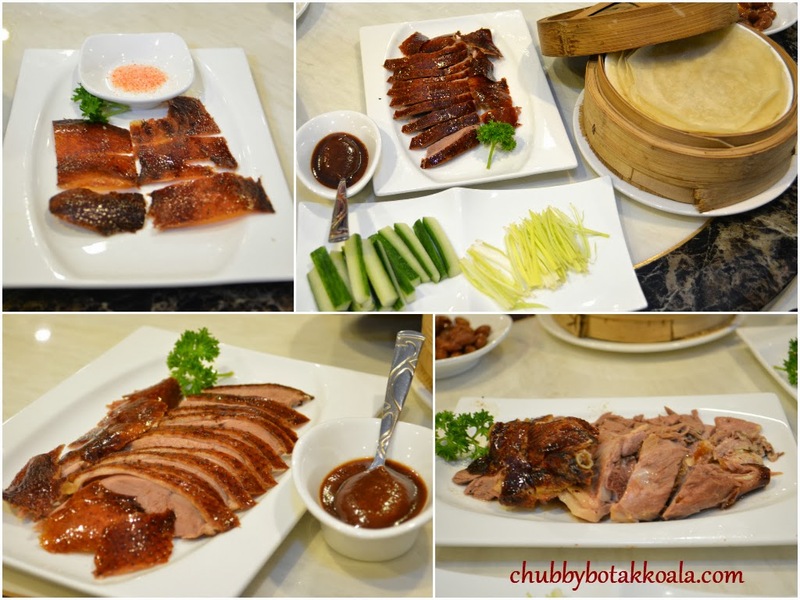 Following the traditional presentation of Peking Duck, the prime cut of the breast skin are served first with sugar. HOME version is thin and crispy, without much fat on it. The rest of the duck has a consistent crispy skin and not oily. Although it looks more healthy, the downside of minimum fat is the meat of the duck become dry and slightly though, which is what happen here. The sauce has a nice flavour and well balance sweetness to go with duck and the wrap. If you order the whole duck, the left over can become the second dish either soup, deep fried or a stir fry dish. Clockwise from Top Left: Prime Cut Breast Skin, The Condiments, The Breast Meat & The Thigh Meat. On some special occasion, they will have roast goose available. We have tried it before and we personally recommend it. Not only roast goose are difficult to find in Singapore, HOME's version got my two thumbs up. It is better than the duck and tasted similar to the one in HongKong. If you are a fish lover, don't miss the fish baked in claypot with Chef Tan In-house recipe. The lemon grass, galangal and spring onions are stir fried first to create a base aroma for the baked fish. Combine with rice wine and baked it on the claypot topped with ginger and parsley, the result is just delicious. The meat of the fish is just tender while the gravy is just a great companion with a bowl of rice. However, as I were expecting more dishes to come, we refrained ourself from ordering rice just slurp the gravy without the carbo. From the four legged section, we have Pan Fried Wagyu Beef Steak. This dish is served on individual plating version. The beef is cooked to medium rare, well seasoned and melts in your mouth. The coarse sea salt accentuate the flavour of the beef. 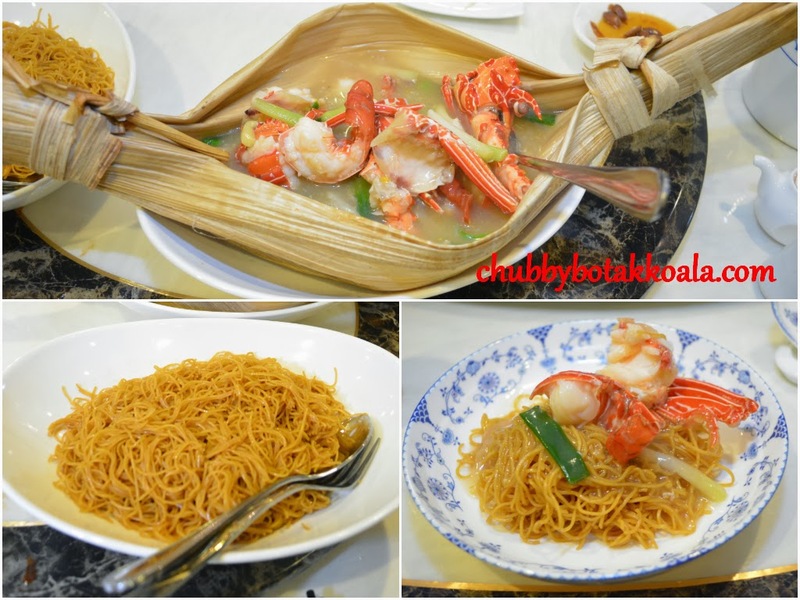 For the final savoury dish, Stewed Homemade Yellow Noodle with Lobster, served in O Ba Leaf. The yellow noodle has a similar texture to wanton mee. It was firstly seasoned with special soya sauce before topped with the lobster and gravy. The noodle is springy or should I say it is simply very Q, absorbs the flavour of the lobster and gravy well while retaining the texture. LD's favourite dish here. On another occasion, we also tried their Braised Duo Rice Vermicelli with Pork Knuckles served in O Ba Leaf. The pork knuckles are home made, braised daily for five hours. The meat are tender and the gravy are robust. Simply put it just delicious even my picky FIL loves it and Tan Hsueh Yun from the Straits Times give her approval for this dish. Service standard can be improve. As they are short handed like many F&B establishment in Singapore, the service staff seems to be overwhelmed and looks disorganised during the peak dinner hours. It is also difficult to get their attention to top up the tea or get a fresh set of plates. Overall, HOME delivery a very good combination of Chinese Cuisine. The Peking Duck are good but missing the Omph factor. The rest of the dishes are perfectly executed, tasty and delicious. It sure is worth the trip to the West side to visit HOME. Cheers!! !